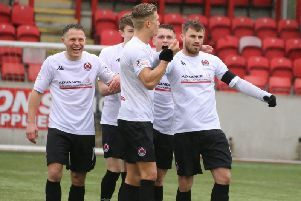 Clyde boss Jim Chapman was this week poised to add a loan signing to his summer recruitment as the build-up to the new season continues. The Bully Wee boss was waiting on the finishing touches being put to the deal which will follow last week’s acquisitions of midfielders Kevin Nicholl and Max Wright. Both played under Chapman at Annan and Chapman stressed the importance, given the scale of his rebuilding task, of having a nucleus of players who are familiar with him and with each other. He said: “When you’re rebuilding you need to make good use of the resources you have. Sometimes because of the expectations you’ve got you’re not afforded time so you’ve got to go with players who know each other and also know you and the workings, demands and challenges that they’re going to face. “That’s why managers will go for tried ands tested playeers who have been at the level you find yourself at. “They help shape and drive the way forward and that provides a real good baseline and a benchmark. I know what exactly I’ll be getting from the players I’m bringing in. “Kevin’s a very experienced player. He’s a defensive type, very strong and aggressive in his play but also very good qualities as well. He has a good bit of leadership about him as well so he’s the type of player who will be at the heart of the defensive unit and we’ll start to shape things round about Kevin. “Max is more of a forward thinking player but also very willing to learn on the negative side. He’s very creative and also has an eye for goal, as he demonstrated last year.